Our compassionate spinal decompression team provides safe, effective non-invasive treatments that relieve pain naturally and allow your body to recuperate and rejuvenate. During the first visit, we make sure to obtain important background information, such as medical history, and give you time to get to know your chiropractor. The goal of treatment is to give you fast, lasting relief from herniated discs, sciatica, stenosis, numbness or pain in your extremities, or chronic back and neck pain through effective spinal decompression therapy. Call us at (218)-568-5648 today. The physical therapists, chiropractors at Hopkins Health & Wellness Center, along with the help of a team of medical radiologists, neurosurgeons and orthopedic spine specialists have developed the innovative non surgical DMR Method for the treatment of neck and back pain, disc herniation, sciatica, degenerative disc disease and other complicated conditions of the spine. The DMR Method of evaluation and treatment is also highly beneficial for non-spinal conditions including sports related injuries, joint pain and other musculoskeletal conditions. Watch the short video on the left to learn more about the ground-breaking DMR Method. "The DMR Method produces consistent results and is an effective alternative to spine surgery. Even when a patient has previously had spinal surgery, the DMR Method helps stabilize the spine and prevent recurrence of symptoms and additional surgery." -John Mullan, MD, Neurosurgical Associates, Ltd.
"We collaborate on many clinical cases using MRI scans before and after treatments to evaluate results, I'm constantly impressed by our patients' excellent outcomes." Working together to help you feel great again! 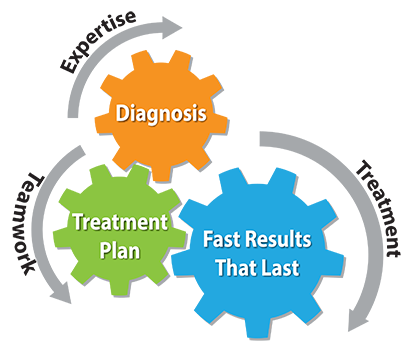 Our team of physical therapists, chiropractors, and manual therapists, along with the help of allied medical professionals will properly diagnose your condition, use teamwork to develop a complete treatment plan and collaborate to provide the right treatment in the right order to produce fast, lasting results. Dr. Lelwica graduated from Gustavus Adolphus College and received her Doctorate of Chiropractic at Northwestern College of Chiropractic. While in graduate school she served as President of the Student American Chiropractic Association and assisted in the teaching of spinal biomechanics. She served as an associate professor for NWCC, teaching interns and treating patients in the women and children’s clinic. After serving the Eden Prairie community for eight years, she sold her clinic and joined Hopkins Health and Wellness. Dr. Gronholz received his Bachelor of Science and Doctor of Chiropractic degrees at Northwestern Health Sciences University in Bloomington, Minnesota after completing his premedical courses at Central Lakes Community College in Brainerd. While in graduate school he completed further training in activator methods, flexion distraction, and advanced diversified techniques. He practiced at Normandale Chiropractic in Bloomington before moving back to the lakes area to join the Hopkins Health and Wellness team in 2015. J.P. graduated from the Physical Therapy program at the University of Minnesota in 1988 and has been practicing in the Pequot Lakes/Brainerd area since that time. He has worked with a wide range of patients with physical problems over the years, but is especially interested in orthopedics which has been the focus of his continuing education. J.P. lives in Pequot Lakes with his wife and son. He enjoys playing music in several area groups, exercising, being outdoors, camping with his family. Lisa graduated from Bethel University and received her Associates in Physical Therapy at St Catherine University. Lisa’s work at Healtheast Optimum Rehabilitation in Woodbury was extensive and diverse. It included therapy for sports injury, post surgical recovery, orthopedic injury, gait training, stroke, spinal cord injury and lymphedema. She also worked with muscular dystrophy, Parkinson’s Disease and amputee patients. She joined Hopkins Health and Wellness in 2015. "After just 4 weeks of the DMR program, I felt alive again! I am able to do everything I used to including lifting weights and prolonged activities thanks to this team of people. I am so thankful!!" "When I first started going to the Hopkins Health & Wellness I could barely stand or walk. Now I can work every day. They did a wonderful job with my back. I would recommend Hopkins to anybody with back problems. Thanks for the good work!"